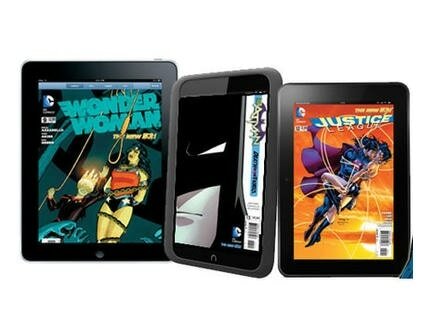 DC Comics went digital in a big way last week when they made their catalog available in iBooks Kindle, and the Nook stores, but that's just the beginning. According to Hank Kanalz, DC Entertainment’s SVP of Digital, this comics book publisher is also planning to expand their digital catalog. But one thing which DC Comics won't be able to do is offer cross-platform availability. Comics bought in one ebookstore cannot be transferred via an external account with DC Comics. Of course, this silo issue is shared by all publishers, so DC is not alone in having their hands tied. What format are they using? We, the user, can take care of their silo issues for them. Probably the proprietary fixed layout for Kindle and Nook as well as Epub3 for iBooks.